Ever wonder what a day in your wizardly garden might look like? Take a peek! Fiery (Evil Magma Pea): Wha … what is that? Mr. Spud? Is that you? It’s 5 AM! Stripes (Tiger Lily): You sound surprised, Fiery. He’s a Couch Potato. It’s what Couch Potatoes do. Fiery: Yeah … I guess …. Mr. Spud: Oh, hey. Good morning guys! 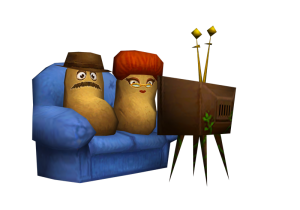 Mrs. Spud (Couch Potato): Dear! Don’t be rude. You can’t just blast some random television show at 5 AM … we have other plots around us. You should ask if they have a show preference first. Mr. Spud: Ah, you’re right. Any requests fellas? Fiery: I can’t even see the screen from down here! Stripes: I can see just fine. It helps to be on the top row, am I right? Fiery: Yeah, Yeah. At least I’m not planted just because I attract pixies! Stripes: Well, it’s better than being a “liked” plant. Just look at Fred! Poor guy was left to wilt. Fiery: You are brought back from the brink of death only to go through it once more for the rest of eternity. Wilting, wilting, wilting … revived … wilting, wilting, wilting … doesn’t it get tiring? Stripes: I very much enjoy my role in this garden, thank you very much. Mrs. Spud: Oh dear, here they go again. I wish we could all get along like we used to back when we were seedlings. Mr. Spud: I just wish I had some cake. Mr. Spud: Anyone else hear that? Mrs. Spud: It’s a buzzing …. Fiery: Get. away. from. me. You vile beasts! Fiery: When is the wizard coming back? Mrs. Spud: I’ve heard stories of forgotten plants you know. Stripes: Our wizard would never forget us. Fiery: Eh, I don’t know. I never trusted that girl. Mrs. Spud: Well, just so you know, wilting starts with a lack of energy, a strange need to hear music, and an unrelenting thirst. Mr. Spud: We’re fine. None of us are experiencing any of that! Stripes: Anyone else feeeeeel tiiiiireeeed? Mr. Spud: It’s a little bit quiet right now, is it not? Mrs. Spud: Why yes, yes it is. Fiery: What did I tell you all? I knew we couldn’t trust that wizard! Mr. Spud: The TV isn’t playing as loud. My color is fading. I’ve never felt so weak. Stripes: We’re losing it. We’re alllll loooooooooosing it. Stripes: Wizard, help me please. Fiery: See? I knew everything would work out. I never doubted that girl. Fiery: That I never trusted anyone else more. 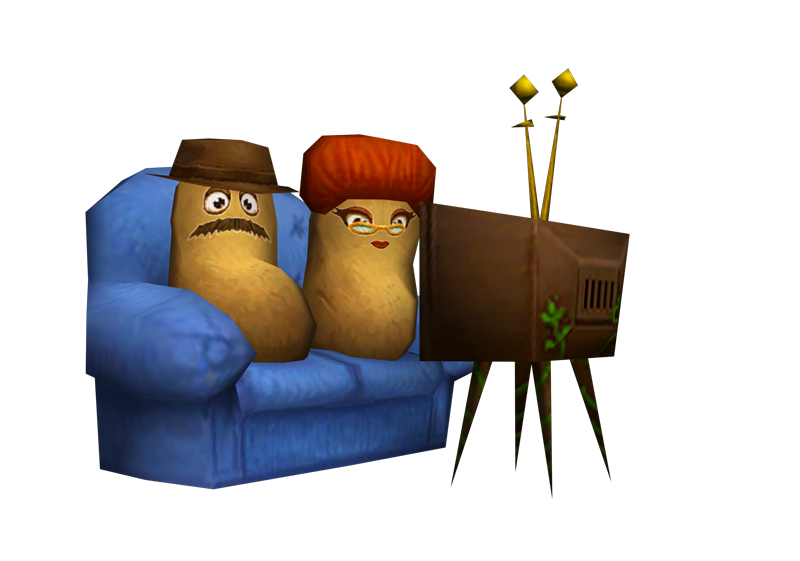 Mrs. Spud: Celebratory movie night anyone?